Please note that I am not able to leave comments for anyone who has a dynamic view. I've been trying all night. It's so nice when they bloom and spread joy in the spring. I have some around the garden, but I think they will gather in one place. The frost looks so refreshing here where it is about a million degrees! Great shot! I just love your frosty polyanthus. The white accent around each petal is gorgeous. Beautiful with the frosty dewdrops. Is it the same flower I'd call a primrose? Beautiful whatever their name. And -- as always thank you for hosting! the frost enhances its beauty. So beautiful. With the hot, humid days we have had lately those frosty blooms look especially nice. Thank you for hosting this wonderful meme. 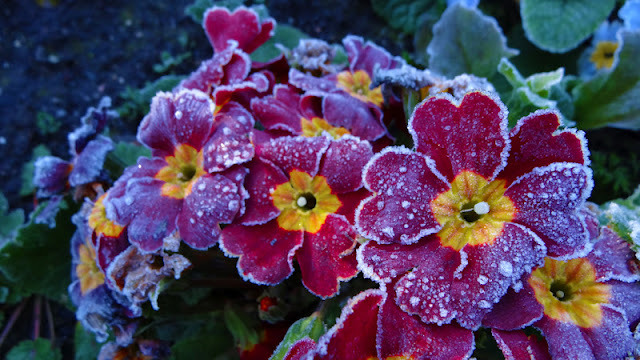 The frosty polyanthus is beautiful! Beautiful although not the thought of frost!